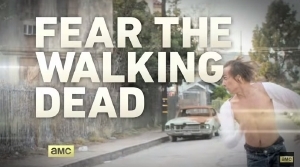 We've seen a couple of clips from AMC's upcoming "The Walking Dead" spinoff "Fear the Walking Dead" but both have been short and given us very little in the way of actual footage from the show which is set to premiere in August. Taking us back the beginning of the outbreak, the new show features new characters as they navigate Los Angeles just as the virus â€“ or whatever it is â€“ starts to kill off the masses. The show already has a two season commitment though it has been announced that the first season will be short with just six episodes. Hopefully they have enough story to drag this initial outbreak story out over two seasons because the last thing I have interest in seeing is a riff on "The Walking Dead." For now, check out the short new teaser below. Expect more in the coming weeks as the release date approaches. Yes, I complain mightily about the Zombie thing but I am intrigued. I will watch the first few episodes. Hopefully FTWD has learned from the mistakes of TWD. This scene reminds me of a dude who is bopping some guys girl or wife, he walks in on them, and he is running away from the guy so he doesn't die from "Terminal Lead Poisoning"